Golden Fields, originally uploaded by ZackTwin. I went to Yaku Shoji Temple which is in a village near to Urasa Town in Japan. The main reason of visiting that template is to see the place where Dr. Ba Maw of Burma (Myanmar) hid during WWII. Dr. Ba Maw was "Naingandaw Adipadi" (head of state) of Burma during Japanese occupation in 1943. He was regarded as traitor, at least by me, before knowing about him details. In fact, he is a patriot who helped to cover up General Aung San’s plan to expel the Japanese from our country. On the way to the temple, we saw many paddy fields, in golden color, which were ready to harvest. I am told that the rice from this region is famous and expensive because the quality is the best. 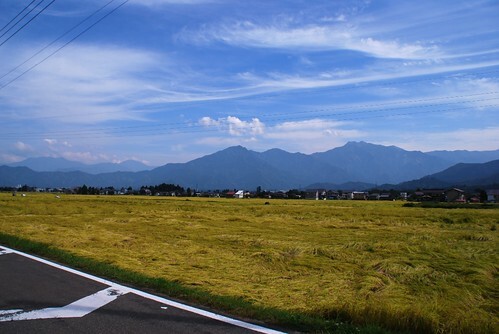 The view of golden color paddy fields with the background of blue range of mountains is stunning. I couldn’t stop taking many photos of the scenery. Firstly I didn’t upload this photo because I thought the nice view was obstructed by overhead power cables. When I see this again, I feel that it’s a feature of Japan because we can’t easily find an overhead power cable in Singapore… So I am sharing this lovely photo to enjoy.